Luis Enrique Mejía López (born September 28, 1962) is a Nicaraguan singer and composer. He attended La Serna High School in Whittier, CA. He started his career in the late 1980s and achieved success in the 1990s, earning the title "El Príncipe de la Salsa" (The Prince of Salsa). He was one of the leading pioneers that led to the salsa romántica movement in the 1980s. 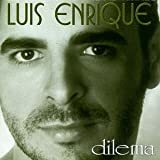 Enrique has received two Grammy Award-nomination for "Best Tropical Latin Performance" for album Luces del Alma and his song "Amiga". He performed and recorded with salsa romántica group Sensation 85, which also included La Palabra and Nestor Torres. In 2009, his album Ciclos was nominated for numerous Latin Grammy Awards, his biggest breakthrough in over a decade. The album won the Grammy Award for Best Tropical Latin Album.